Speaker: Don Meinheit, Ph.D., P.E., S.E. Wiss, Janey, Elstner Associates, Inc. This SE University session is Part 2 of a two-part series on anchors, and will focus on certification of installers and inspectors, discuss the design of anchors and how to specify/procure anchors, and review compliance testing. During this session, Donald Meinheit, PE, SE will discuss these issues and provide practical background for specifying anchors on contract documents. Discuss code applications to design problems. Explain why there are qualification standards. Identify code requirements for installation and inspection certification. List suggestions for compliance testing. Handouts and registration emails for this session will be sent to SE University companies on Friday, September 7th. Engineering managers consider communication to be a critical skill for employees. In fact, successful engineers are not only technically competent but also effective communicators. Although writing remains an essential way to disseminate information, technical and business writing frequently fails to satisfy the audience’s information needs or confuses readers with unnecessarily wordy and complex content. In this SEU session, participants will discover how engineers may employ fundamental elements of rhetoric—Aristotle’s appeals to logos, ethos, and pathos—to engage with and persuade readers. With examples presented in the framework of a writing process, participants will also learn tactics to improve the clarity, coherence, and conciseness of their writing. Handouts and registration emails will be sent to SEU companies on Friday, October 5th. This SEU BIM Forum session will include a demonstration of features in Autodesk Revit 2019 software, including the 2019.1 update install. During the session, Betsy Werra will be exploring the latest development of Revit enhanced tools for structural engineers and designers. This session will cover the new Core features including Improvements to the User Interface, Viewing Tools, and Documentation, as well as the structural improvements for Steel Design, Concrete Detailing, and the Structural Precast Extension in Revit 2019. Recognize the new enhancements in Revit 2019 & Revit 2019.1. Identify how the Revit Core enhancements can be implemented in your everyday workflow. Identify improvements for rebar, precast, and steel design in Revit 2019. Handouts and registration emails will be sent to SE University companies on Friday, October 19th. This SE University session will review the changes to the ASCE 7 Wind Load Provisions that were adopted in the 2016 edition that is referenced in the 2018 IBC. Some of the changes that have the greatest impact on the design provisions are new Wind Speed Maps used in design, the inclusion of an Elevation Factor, and new Roof Pressure Coefficients. The presentation will explain the background of the new provisions to help engineers understand how and when to use these new provisions in their designs. Understand the effect the use of the new Elevation Factor has on their design. Handouts and registration emails will be sent to SEU companies on Friday, November 9th. ASCE 7-16 Minimum Design Loads and Associated Criteria for Buildings and Other Structures was recently published and has been adopted by the 2018 International Building Code. ASCE 7-16 includes many technical updates, including numerous important changes to the seismic requirements. This presentation will highlight the important changes to Chapters 11, 12, 16 and 21. Key changes include update to the soil amplification factors tables, amplification of diaphragm transfer forces, new structural requirements for sites susceptible to liquefaction, updated seismic design values throughout the country, and completely rewritten chapter on nonlinear response history analysis. Handouts and registration emails will be sent to SEU companies on Friday, December 7th. Speaker: R. Bradlee Fletcher, S.E. Trusses are one of the more common uses of Hollow Structural Sections. The joints and the connections of HSS members in trusses can be the cause of confusion during design and unneeded costs during fabrication. 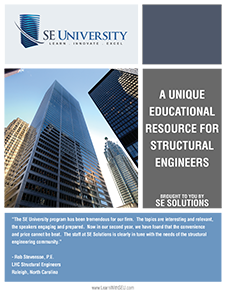 This presentation will highlight how to avoid some of the common pitfalls when it comes to designing and detailing HSS truss connections by sharing some simple rules to follow when sizing the truss members and designing the joints and their connections. Handouts and registration emails will be sent to SEU companies on Friday, January 4th.